The vetting process for selecting outsourcing partners is time consuming and complex. To support the process, Life Science Leader developed the CMO Leadership Awards in 2011. We think sponsor company opinions are important and credible — that’s why the awards are based on customer feedback. Winning CMOs are chosen through impartial market research based on feedback from sponsor companies that utilize outsourcing services. Primary market research by Industry Standard Research (ISR) is the basis of the awards. Sponsors provide ratings of CMOs based on recent outsourced projects. This experiential feedback is analyzed by sponsor company size to reveal leading CMOs in different performance categories. For details on the research methodology, visit isrreports.com. Would you like to participate in the research? Email your request to ISR. Based on the research, award recipients are announced in Life Science Leader’s awards supplement – a resource for sponsors and CMOs alike. The annual issue includes original editorial, outsourcing industry trends, and award-winning CMO profiles. Life Science Leader is a monthly publication available in digital and print through subscription. 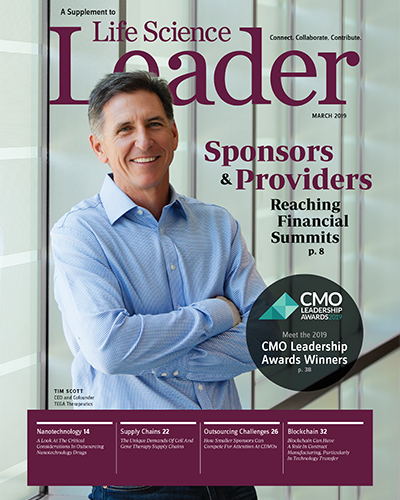 "The CMO Leadership Awards issue and all of its features came to us at the right time. We used the award issue to help us understand the landscape and the type of services that all the different companies are providing, which helped us with the initial identification of companies that we then researched more extensively to learn of their capabilities and match them to our needs." The most recent awards supplement was published in March 2019. Survey Methodology: ISR's Contract Manufacturing Quality Benchmarking research is conducted annually via an online survey. For the 2019 CMO Leadership Awards, more than 120 CMOs were evaluated on 23 performance metrics. Research participants were recruited from biopharmaceutical companies of all sizes and were screened for decision-making influence and authority when it comes to working with CMOs. Respondents only evaluated companies with which they had worked on an outsourced project within the past 18 months. This level of qualification ensures that ratings come from actual involvement with a business and that companies identified as leaders are backed by experiential data. CMOs must meet the minimum threshold of customer survey responses to be eligible for an award. Each year, we gather in celebration of drug development and manufacturing. Award recipients are recognized during a ceremony, after which we enjoy great food, drink, and company. Research participants, winning CMOs, and other industry stakeholders are invited to attend. The CMO Leadership Awards Ceremony & Reception is not associated with DCAT or DCAT Week. The CMO Leadership Awards recognize top outsourcing partners, determined by feedback from sponsor companies who outsource manufacturing. The awards are presented by Life Science Leader and Industry Standard Research. Life Science Leader is a business journal for executives in emerging biotech through big pharma. Monthly issues feature interviews with executives from industry, the FDA, and more. Industry Standard Research is the premier, full service market research provider to the pharma and pharma services industries. With over a decade of experience, ISR delivers an unmatched level of domain expertise with off-the-shelf intelligence and custom research offerings.